In this page, you’ll find how this specific lesson plan, Building a Basic House, is aligned to the Common Core Mathematics Standards organized by grade level, domain, and standard ID with in-depth explanations and examples. CCSS.MATH.CONTENT.3.OA.A.3: Students are using the equation P = 2(L+W) – 4 to find perimeter and A = L(W) to find area. CCSS.MATH.CONTENT.3.OA.A.4: Students are figuring out the perimeter and area when the length and width have been determined. CCSS.MATH.CONTENT.3.OA.B.5: In the Basic House, Farm, and Parthenon lesson plans, students learn are given opportunities to learn about the commutative, associative, and distributive properties of multiplication through the equations for perimeter and area. CCSS.MATH.CONTENT.3.OA.D.8: In the Algebra Architecture lesson plans, students are constantly using the four main operations with letters standing for unknown quantities. Students are using formulas to help them solve other formulas. CCSS.MATH.CONTENT.3.MD.C.5.A: In the Algebra Architecture lesson plans, students are measuring side lengths by blocks, which are essentially unit squares. CCSS.MATH.CONTENT.3.MD.C.5.B: Students are measuring length and width to calculate the area of their structure, which can be measured in units squared. CCSS.MATH.CONTENT.3.MD.C.6: Students are using improvised units (e.g. blocks) to measure the area, but can easily use units squared. After calculating their area, they can check their work by counting the number of blocks. CCSS.MATH.CONTENT.3.MD.C.7.B: Students are using whole-number side lengths to find the areas of rectangular structures that can easily be translated to real-life contexts (e.g. architecture). 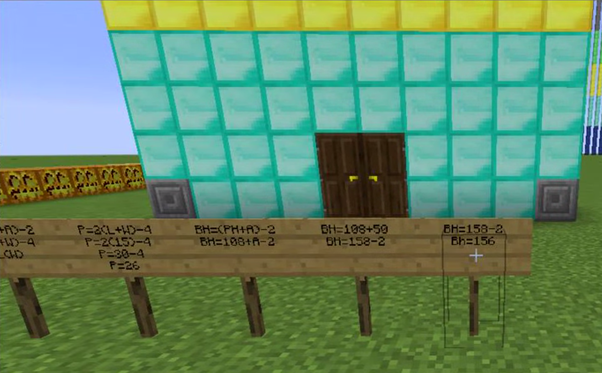 CCSS.MATH.CONTENT.3.MD.C.7.D: Since structures in Minecraft are already decomposed into clearly visible units of measurement (blocks), it makes it very apparent that area is additive. CCSS.MATH.CONTENT.3.MD.D.8: In three of the five lessons of Algebra Architecture — Building a House, Farm, and Parthenon — students are solving for perimeter given the measurements of the dimensions of their structures. When given the opportunity to build multiple structures, students can see that different dimensions may have the same area but different perimeters (e.g. 8×5 and 10×4) and vice versa. CCSS.MATH.CONTENT.4.MD.A.3: Students are directly using the formulas for area and perimeter to build digital structures, which can be applied to real-life contexts, such as architecture. CCSS.MATH.CONTENT.5.OA.A.1: In the house, farm, and Parthenon lesson plans, students use various formulas, including area and perimeter, that contain parentheses; they must be able to evaluate these calculations correctly by applying the order of operations. CCSS.MATH.CONTENT.5.OA.A.2: When creating walls or columns, students will understand that finding the number of blocks involves manipulating the perimeter (multiplying and/or dividing the perimeter by a whole-number). By setting up the formula without solving it, students will be able to interpret the numeral expression before solving it. CCSS.MATH.CONTENT.6.EE.A.2.A: The equations for perimeter (P), area (A), and total number of blocks (Bh) for the basic house contain letters that stand for numbers and will change depending on values of other variables (length, width, height). CCSS.MATH.CONTENT.6.EE.A.2.B: When solving the equation for perimeter in Minecraft, P = 2(L+W) – 4, students should be able to explain that perimeter is the “product of two times the sum of the length and width, minus four.” They will do this throughout as the lessons challenge students to use language to describe each of the formulas being used. CCSS.MATH.CONTENT.6.EE.B.6: The equations for the basic house, road, farm, and Parthenon lesson plans are comprised of perimeter, area, height, length, width – all mathematical terms that are used in real-life. Furthermore, students begin to build an understanding of how to read algebra as a language where variables stand for unknown numbers. CCSS.MATH.CONTENT.6.EE.B.7: In the house, farm, road, and Parthenon lesson plans, students must evaluate expressions in which letters stand for numbers on both sides of the equation (e.g., A = LxW), and build an understanding of the relationship between variables in a given expression. CCSS.MATH.CONTENT.6.EE.C.9: Since many formulas used in the house, road, farm, and Parthenon lesson plans involve variables on both sides of the expression (A = LxW, P = 2(L+W) – 4, S = 3L/2), students will see that changing one variable will result in the change of the other variable. Letters standing for numbers and understanding the relationship between those letters is a key aspect in this lesson plan. CCSS.MATH.CONTENT.7.EE.B.4.A: In using the formulas for perimeter and area in the house, farm, and Parthenon lesson plans, students are manipulating the variables to determine their given values. For example, if a student wants to make their Area = 35 and are given width = 5, they must set up the equation to determine what the length would be.